The Supair Access Airbag offer an up right seating posture, easy transition from running to seating, reinforced bottom support, light, AirBag protection and large dorsal storage compartment. Easy transition from running to seating. – Upright to recline seating body posture. – Mini Bump back protector. – Harness color coded riser connection points. 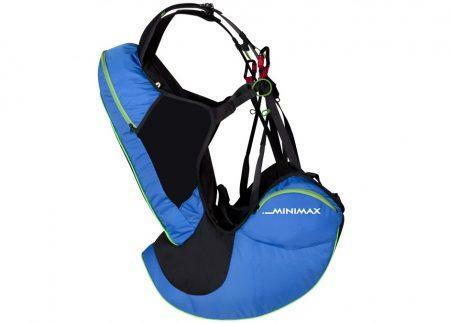 – Leg and chest straps comfort foam. – Built-in neoprene shoulder strap radio pocket. – Chest strap adjustment with stitched markers. WARNING! This product is delivered without risers! 1. 2 Twist-lock 45 mm Zicral SUPAIR Carabiners, 2. Size XL: Ply seat-plate 39 cm x 37 cm (MPPL020), 3. Size L : Ply seat-plate 37 cm x 37 cm (MPPL019), 4. Size M: Ply seat-plate 35 cm x 37 cm (MPPL018), 5. Size S and XS: Ply seat-plate 33 cm x 34 cm (MPPL017) – Mini Bump – "B" handle, 6. WARNING! This product is delivered without risers!